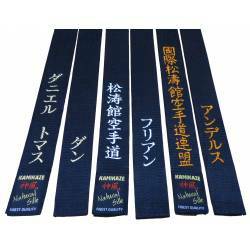 Satin and Pure Natural Silk Karate black belts from Kamikaze and Shureido. With personalized embroideries in your language or in Japanese and your association style ryu ha label upon request. Made to measurement. 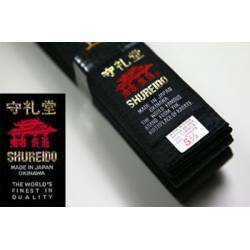 First class SHUREIDO PLAIN black belts in silk-satin superior quality. 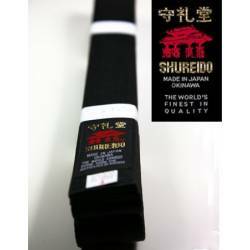 First class SHUREIDO black belts in silk-satin or cotton superior quality SPECIAL THICK. Approx. 4 to 4,5 mm thick instead of 3,5 mm. Width: 4,5 cm instead of 4,2 cm. Highest quality heavy weight (+ 40-50%) inner and outer construction. 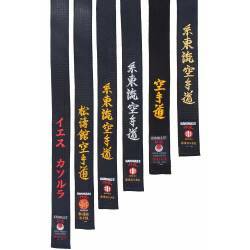 First class KAMIKAZE PLAIN black belts in SILK-SATIN superior quality. All sizes available. 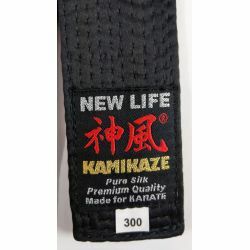 First class KAMIKAZE black belt in NATURAL SILK. 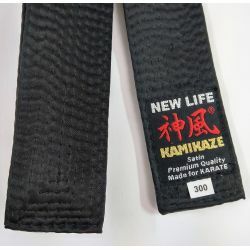 The most exquisite quality you can imagine for a Karate black belt! 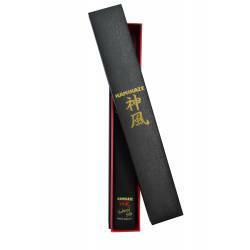 Comes in a beautiful individual black gift-presentation box for special occasions.